G.L. Watson & Co. Ltd. were delighted to join with the Royal Mersey Yacht Club in welcoming HM King Harald V of Norway to Liverpool. His Majesty visited the RMYC where he accepted a Honorary Life Membership before travelling, by yacht, to the offices of G.L. Watson. 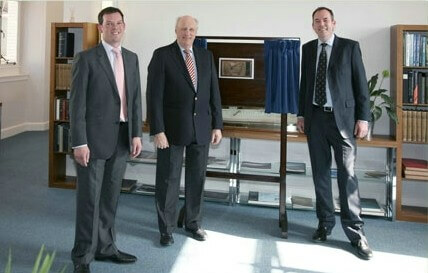 He was welcomed by Managing Director Dr William Collier, Director Antony Harrison and other members of staff. During his visit to the G.L. Watson offices he was able to view the extensive collection of artefacts, photographs and plans of original G.L. Watson designs that the company hold in their archives. The King unveiled a plaque to commemorate his visit and was presented with a photograph album of R/Y Norge to mark the occasion. The visit culminated in a reception and civic dinner held by RMYC in the King’s honour at the Town Hall in Liverpool, along with His Royal Highness the Duke of Gloucester.